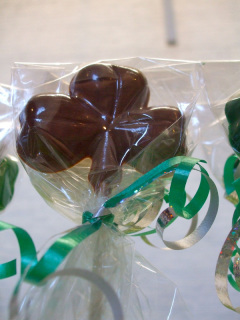 Leprechan: Molded candy presented on a lollipop stick wrapped in clear cellophane wrap and tied with a festive curled ribbon. Flavor: Milk, white, or green tinted chocolate. Weight: 1.50 oz. SKU #2. Specify quantity. Price per item. Photo: Lucky. Image © Alice Merkel. 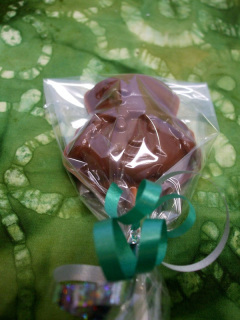 Pilgrim Chocolate Pops for Fall 2012. Available in milk, dark and white chocolate. (No picture available).